You want to know the weather of your city easily and fastly? 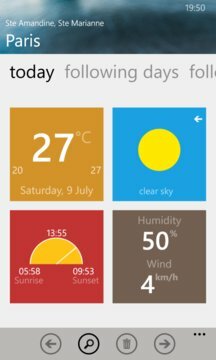 Quickly check the weather of world's cities thanks to this app! You will have access to the current weather with average temperature, humidity, wind speed, time of sunrise and sunset. In addition forecasts for the 4 next day are also available with the maximum and minimum temperatures. Now you have the ability to scroll through several towns on the dynamic tile and change is background. 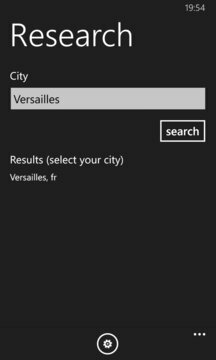 If you do not find your city suggest it in the comments and it will be added as soon as possible.